The Super Bowl is America's biggest sports stage and the world watches its players. All season, fans and pundits discounted the New England Patriots as not being what they once were. But in the Super Bowl, they were who they thought we were. For the sixth time, Tom Brady led his team to a Super Bowl championship (defeats of the St. Louis Rams, Panthers, Eagles, Seahawks, Falcons, and now the Los Angeles Rams). This time the final was 13-3. But it was a receiver who was the most unstoppable force. In a defensive struggle, where very third down counted, Julian Edelman was the key to moving the chains, keeping time of possession, and willing the Patriots to victory. at 5'10" and 198 pounds, he looks a lot more like a normal guy in your gym than the best player in the Super Bowl. But in Super Bowl LIII, he garnered 10 catches (on 12 targets) for 141 yards. Both were season highs. He had a carry for 8 yards as well. Brady will always be remembered for the glory and rightfully so. 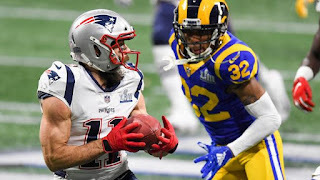 But it was Edelman who stole the Super Bowl LIII show.